The 8th Belarus Reality Check took place on October 22, 2018, in Vilnius, Lithuania. 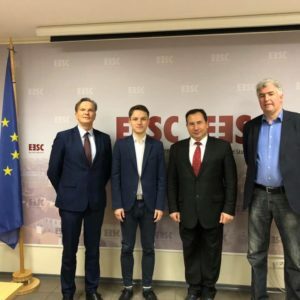 The event gathered leading Belarusian and international experts and practitioners to discuss the latest political, economic and security developments in Belarus and to provide evidence-based analysis and balanced policy advice. This non-paper is the result of the meeting as well as further research. After the August 2018 change of government, Minsk is now operating in “safe mode.” The new government came to power amid a series of destabilizing events, including corruption and mismanagement scandals, while the 2020 presidential and parliamentary elections are on the horizon. The Siarhei Rumas administration was appointed first and foremost for its managerial credentials. It represents a break from the previous nomenklatura-style governments. This falls short of systematic change, however: President Alexander Lukashenka remains the country’s key decision-maker and the security services are in control of the implementation. Nevertheless, the country is undergoing a slow and subtle transition to a market economy. The impact of decades-long redistributive policies — with the middle class now comprising 80% of the population — has shifted Belarusians’ value system from entitlement toward enterprise. The public’s key unmet expectation from the state, that it “create conditions for citizens to make money,” is a cause of growing frustration with the regime. The social contract is currently under re-negotiation, and some social groups (SME, IT, the real economy, civil society, etc.) are seeing benefits from the country’s cautious economic reforms. The regime has also become friendlier toward certain civil society groups. While the government’s so-called policy of “soft Belarusization” has not brought about any large-scale reform of language or education policy, it has nevertheless allowed the state to engage with citizens who prefer a Belarusian identity without alienating more traditional (i.e. Soviet-minded) people. Managing this “house of cards” — dependence on an external funding source and on Russian markets — is the key to maintaining the social contract. Although the Belarusian economic model is not sustainable, it has nevertheless worked for over 20 years. Minsk was able to absorb “shocks” from several economic crises while also reducing subsidies from Moscow and energy rents from 2006 onward. The state’s biggest headache is growing debt, particularly that of ineffective state-owned enterprises (SOEs). In addition, the purchasing power gap between Belarus and its neighbours is growing, adding to overall disillusionment within society. There is rising speculation in the West that Belarus’ sovereignty may be in jeopardy. In particular, the worry is that Moscow may consider using the Union State consisting of Belarus and Russia to keep President Putin in charge after 2024, albeit in a different role. Although Russia’s strategic goal — to limit Belarus’ freedom of action in foreign and even domestic policy — has not changed, Moscow no longer treats President Lukashenka as its only Belarusian interlocutor. Since 2015, the EU’s policy of critical dialogue has led Minsk to take a more constructive attitude to a number of issues, including human rights dialogue. Since 2015, the EU’s policy of critical dialogue has led Minsk to take a more constructive attitude to a number of issues, including human rights dialogue. However, no systematic political change is in the works. Negotiations over a basic bilateral partnership agreement with the EU are locked due to Vilnius’s opposition to the Astravets nuclear power plant under construction by Russia’s Rosatom, while Warsaw blocks progress on a visa facilitation deal. Even though the United States and European Union have lately been re-discovering Belarus’ geopolitical importance, Poland and Lithuania put their own interests first instead. While the economy is recovering and the “parasite tax” — which had spiked political tensions over a year ago — has been watered down, the question of Belarus’ debt and the challenges of external financing have come into the spotlight. The country again faces a “transition” at a time when government debt obligations are too high and reserves too low. Moreover, presidential and parliamentary elections are approaching in 2020. The Rumas government, appointed after healthcare-related corruption and regional development program embezzlement sparked national scandals, is certainly reform-minded. Compared to its predecessors, the new government appears to have a more realistic understanding of the need for reform but does not want to make unnecessary promises. Its reform program includes separating ownership and regulatory functions in state property management, as well as abolishing criminal prosecution for tax violations—thereby addressing law enforcement’s “extortionary” tax collection practices. To maintain economic growth, the government wants to focus on developing the service sector, achieving large-scale digitalization, keeping inflation low, improving investment policy, and continuing to reduce regional inequalities. At the same time, newly-appointed Prime Minister Rumas was primarily selected as a reliable and efficient manager, not a reformer. President Lukashenka now seems to trust the government more and grant it greater authority than in the past. But while the president does not want to engage in micro-management, he is also clearly keeping the direction of policymaking under his control. Thus, the question is about how much room for manoeuvre the new government actually has. This is especially important with the 2020 elections approaching. Current economic and social policy is framed by the interests of Belarus’ broad middle class, which was created through redistributive policies. This redistribution—even if recently accompanied by the ill-treatment of entrepreneurs as well as the placement of the burden of cost-of-living increases on the shoulders of ordinary citizens—has had a significant impact. These factors have transformed public expectations and shifted Belarusians’ relations to state from entitlement toward market economy conditions (Graph 1). 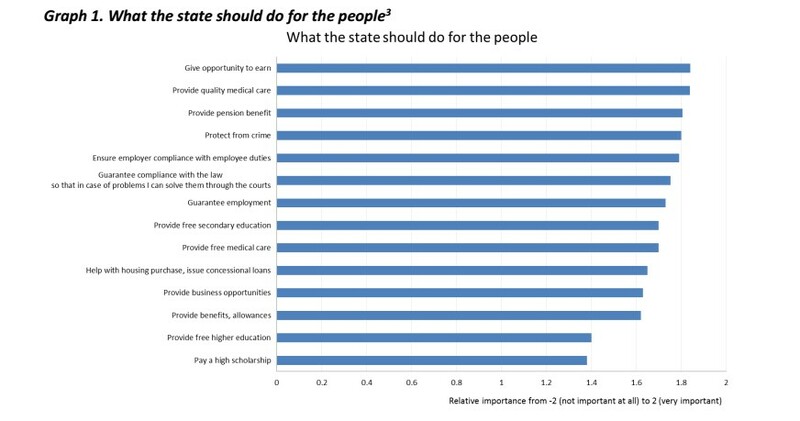 According to a recent survey, the public’s key expectation of the state is now that it “create conditions for citizens to make money,” a clear sign of frustration and disillusionment with the system. Despite signs of common sense on the part of other policymakers, the head of state and the security establishment have little interest in a systematic transition. Until the 2020 elections, the government’s main focus will be on attracting more investment and increase public spending in regions that are lagging behind—as a means of addressing dissatisfaction and minimizing social tension. This is evident from the most recent high-level Belarus-Russia and Belarus-Ukraine regional forums. The usual pre-election increases in social spending — including higher pensions and public-sector salaries as well as housing support for large families — will put further pressure on the budget. The main challenge Belarus faces continues to be the absence of consensus on how to reform the social welfare system. Minsk still runs large state companies in part as a source of employment. Many reform measures are simply not taken out of fear of increased joblessness and the accompanying political ramifications. At the same time, the social contract is under re-negotiation, and some social groups are benefiting from ongoing, if cautious, economic reforms such as a modest expansion of the private sector and limited liberalization. In particular, groups that do not heavily depend on state budget (SMEs, the IT sector, the real economy, civil society, etc) are seeing notable benefits. In the past several years, a great number of businesspeople have accumulated wealth as private entrepreneurs, rather than as the administrators of state-owned enterprises. While the economic transition is slow and subtle, the regime has also adopted a “combined” approach to the opposition and civil society groups, becoming notably more tolerant towards some. This has been happening in part due to the above-mentioned policy of “soft Belarusization”, and in part, because there is simply no viable and visible alternative to the current political system. As part of this approach, some independent journalists, bloggers, and political activists are regularly detained and fined — while, at the same time, the authorities have released political prisoner Dmitry Polienko and continue to authorize traditional opposition rallies. The political opposition is marginal, fragmented and continues to operate in a difficult political landscape. Even the question of how to conduct rallies divides opposition forces. Accordingly, the opposition is unable to take advantage of the opportunities that exist; for example, according to a recent survey, 67% Belarusians would like to see a stronger opposition. However, there is one significant shift in the political environment: it is no longer characterized by a stark binary choice between the regime and the pro-democracy opposition. Now, Russia — with its ample resources — is emerging as a visible political player in Belarus. Economy: House of Cards Forever? In the first decade of the 2000s, Belarus’s economic model yielded decent growth coupled with low inequality and full employment. The country’s current politics have been shaped by its rapidly growing middle class. As much as 80% of the population is considered middle class if measured using the baseline figure of $10 or more per day in spending (Graph 2). Belarus has been a “star performer” when it comes to sharing the benefits of economic growth across all of society. Guaranteed employment proved to be both an effective policy and the pillar of the country’s social contract. Not even the 2015-2017 recession had a serious impact on the poverty rate. Due to redistributive policies and government regulation, standards of living grew more equal. Furthermore, Belarus managed to maintain a sense of social justice — despite the lack of democratic elections after 1996 — by taking tax evasion and fighting corruption seriously. Belarus’ growth has been fueled by capital accumulation through high investment, although this has masked low productivity growth. High foreign borrowing and a shortage of domestic savings have resulted in increased vulnerabilities, although reforms in some areas — for example, guaranteeing the independence of the country’s central bank — have yielded results. The gradual shift toward an inflation-targeting regime resulted in a higher exchange rate and price stability. Official reserves have risen significantly, though they still remain considerably below the levels required. The economy’s growth rate this year is 3.8%, thanks to the (temporary) effect of currency devaluation as well as price increases in primary products (primarily commodities and oil). 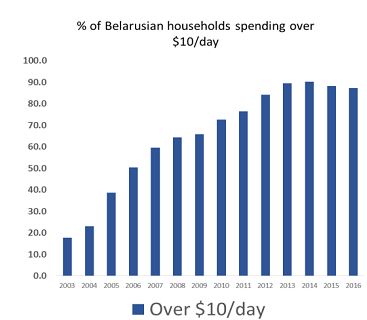 Household living standards have recovered to 2011 levels, but the purchasing power gap between Belarus and its neighbours is growing. This is painful both for the new middle class and for the government as Belarus had previously closed much of the gap. The pace of growth has slacked off in recent years; now, even if 3% growth continues, it will take Belarus 39 years to catch up to Poland. If it does not, Belarusians may vote with their feet, and the decision to move west might be easier, given that Warsaw has an aggressive labour migrant strategy vis-à-vis Belarus and Ukraine aimed at addressing its own labour crisis (Graph 3). The dollarization of the Belarusian economy makes monetary policy volatile, and the country’s forex reserves are lower than usual. Accordingly, maintaining macroeconomic stability will require addressing inefficient SOEs, as well as the country’s vulnerability to external shocks — especially those connected to the Russian market, as 40% of exports, go to Russia (70%, if commodities are included). Because the cost of a serious crisis would be very high, Belarus must continue to pursue regional stability with a proactive foreign policy to protect its economic model. Russia — with its Eurasian Stabilization Fund — plays a dominant role in the region. Despite ongoing clashes with Moscow, Minsk has nevertheless managed relations with its key donor successfully for over 20 years. Belarus’ “house of cards” – i.e. dependence on external sources – is the key to maintaining its redistribution-based social contract, which keeps the wider middle class satisfied with the state system. To keep its house standing, Belarus must not only manage its relationship with Russia but also further expand positive trade relations, both with its immediate neighbours as well as countries further afield. Although the Belarusian system is ultimately not sustainable, it has nevertheless functioned for over 20 years. Minsk has been able to absorb “shocks” from (several) Russian economic crises and has managed to adapt to reduced subsidies and energy rents from Moscow beginning in 2006 (Graph 4). The main Western policy suggestion for Minsk is to reduce dependence on Russia. One possibility — as other Central and Eastern Europe countries have done as EU members — is to develop a greater dependence on Germany; this is considered less dangerous by international financial organizations, as the German economy is much bigger and more stable than that of Russia. Minsk should be more economically linked with the EU and needs actively to encourage production and export relations with Brussels. Belarus’s biggest headache is its increasing debt, 45% of which is made by state-owned enterprises (SOEs) subsidized by the Belarusian (state) banking system. The government is now considering restructuring some money-losing SOEs. The Belarusian private sector is now relatively large. It competes with SOEs not only in the retail trade and other areas where the state has been relatively passive but also in sectors where the state is traditionally strong such as manufacturing (of which the private sector now accounts for a 25% share) and services (30%). The number of Belarusian SMEs is still far below those in EU countries; however, they are gradually moving beyond the limitations of bad regulations and conflict with the authorities toward overcoming other serious challenges, for example, the quality of education of the country’s workforce (Graph 5). Long-term analysis of the trends in foreign policy indices (Graph 6) shows that Belarus has managed to diversify its international relations under a multi-vector foreign policy, although ties with Russia remain the widest and deepest. Minsk’s assistance in regulating the Ukraine conflict has earned (Western) appreciation. However, while some now call Belarus a new diplomatic hub, there is growing concern that Moscow poses a great risk to the country’s sovereignty. The EU`s critical dialogue with Minsk has brought some results: the government of Belarus now takes a more constructive attitude on a number of issues, including human rights dialogue and political prisoners. Brussels’ approach is to address individual cases privately, not publicly. However, even if attitudes may have shifted, the EU’s approach has still not led to a breakthrough on key issues like freedom of assembly or press, nuclear safety and the death penalty. Regional security remains important for Poland and Lithuania, while Minsk’s transparency on military exercises, as well as resistance toward a Russian air base on its territory, has strengthened its (quasi-) independent position. While Belarus’ relations with the EU have distinctly improved and the two parties have moved to normalize and formalize their ties, negotiations on the basic partnership agreement seem deadlocked over Lithuania’s strong objections to Belarus’ Astravets nuclear power plant, now under construction by Russia’s Rosatom. Moreover, progress on a visa facilitation agreement is blocked by Poland due to Minsk’s non-compliance with Poland’s request for an increase in its number of consuls. Although the Astravets project passed a recent EU stress test designed to assess the probability of a nuclear disaster, Lithuania continues to distrust Minsk — and now links nuclear safety with every other item on the EU-Belarus agenda. One of Vilnius’ concerns is that the project puts further pressure (through competition) on its own energy utility companies while calling into question Lithuania’s overall energy policy. Meanwhile, Belarus’ continued pressure on political activists and renewed crackdown on journalists have fueled renewed Western criticism of the country’s human rights situation. Despite deepening bilateral relations with Washington, Minsk failed to satisfy the requirements for fully lifting US sanctions. So far, these restrictions have been renewed (and then immediately frozen) every 6 months, indicating that Congress views an eventual display of goodwill by Minsk — e.g., fulfilling some conditions such as registering political parties or human rights groups — as inevitable. Meanwhile, trade is booming between Belarus and the EU. In January-August 2018, trade increased by 28.7% to $11.6 billion, with exports of goods to the EU increasing by 43% to $6.9 billion, and imports growing by 12.2% to $4.7 billion. Russia`s strategic goal — to limit Belarus’ freedom of action in foreign and even domestic policy — has not changed. In fact, Moscow has a new tactic in the relationship: it has ceased to treat President Lukashenka as its only interlocutor. With the appointment of Mikhail Babich as its new ambassador, Moscow has started openly to engage with other actors. Moscow has also reminded Minsk that there is one institution in Belarus that the latter does not control: the Belarusian Orthodox Church, which is subordinate to the Moscow Patriarchate. It is no coincidence that the synodal meeting responding to Ukraine’s moves towards church autocephaly took place in Minsk. However, there is no reason to believe that Moscow plans to threaten Belarus’ territorial integrity into question. Overall, it is still cheaper and more productive for Russia to continue supporting Minsk in its time of need, even though this has grown more difficult since 2006 due to frequent clashes between these two nominal allies. At the same time, there is little reason to think Moscow lacks contingency planning — for example, to utilize the Union State between Belarus and Russia to keep President Putin in charge after 2024. Belarus’ growing debt obligation toward Russia should be a concern, as this is how Minsk lost control of its gas distribution system (though not the transit pipeline) in 2011.19 Gazprom’s ownership of Beltransgaz makes it impossible for Belarus to someday follow Ukraine’s example and purchase gas through reverse flows from Europe, thereby challenging Russian gas dominance in the country. Economic relations with Ukraine remain positive; trade is growing, but political relations are rather tense. Security concerns over the Belarus-Ukraine border (Minsk cites illicit arms flows from Ukraine) and spy scandals (a Ukrainian spy was caught and sentenced in Belarus, while a young Ukrainian was abducted from Belarus to Russia) have complicated bilateral ties. Meanwhile, relations with Poland are characterized by the absence of real progress despite the growing intensity of contacts. Just as the Ukraine conflict changed dynamics in the region, the new Polish government has changed its predecessor’s policy of isolation toward Belarus. Several issues — the small border traffic agreement (not ratified by Minsk), the status of the Polish minority in Belarus, and the issues surrounding Belarus’ military exercises with Russia — limit efforts toward greater engagement. Economic cooperation is also improving, but Western sanctions on Russia also affect Polish investments in Belarus. This non-paper has been prepared by a group of international experts based on the findings of the 8th Belarus Reality Check meeting held on October 22, 2018, in Vilnius. Its pdf version is available here. In early October 2018, Belarus and Russia settled the agreement about oil supplies for the remaining part of 2018 and for 2019. Unexpectedly, the Russian leadership abandoned pressure on Belarus. While in August-September, the Kremlin believed that they could force Lukashenka into making concessions in the matters of genuine integration, later they backed down. There exist several possible explanations for the Kremlin’s tactical retreat: the threat of autocephaly of the Belarusian Orthodox Church, the interest in laying a gas pipeline, and the approaching talks on the extension of the lease of military facilities. Belarus is an important participant of integration processes with Russia (CSTO, EurAsEc, and CIS); moreover, it is the only European participant of these projects. An intensive flow of freight goes across the Belarusian territory, including that of Russia, delivering to the West around 60m tons of oil and around 40bn cubic meters of gas. Meanwhile, this is a cheap transit. Belarus communicates Russia to its Kaliningrad enclave, supplying the land with gas and electricity. 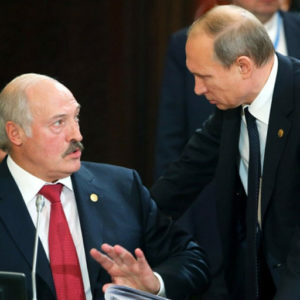 Lukashenka once said that 10 million Russian citizens worked at Russian enterprises that were connected with the Belarusian technological chain, supplying component parts. Perhaps, the figure is too high. However, this factor is not to be ignored. High-technology production of Belarusian enterprises of the military industrial complex is important for the Russian military industry. Especially, after losing manufacturing cooperation with Ukraine, at the background of tension with the West. And especially, if Russia proceeds in the arms race with the West. The central region of Russia is shielded by the Belarusian air-defence system. In the territory of Belarus, there is a missile launch tracking station and the station of radio electronic intelligence Volga (near Hantsavichy town, the Brest region) and the communication centre for atomic submarines Antey (near Vileyka town, the Minsk region). One should also take into account the Russian home politics factor, the factor of public opinion. The Russian society wants to see Belarus as an ally, especially at the background of the strained relations with the West. There are several reasons that explain why every time when the Kremlin was about to tie Belarus to Russia securely, after a period of pressure Russia always stepped back. This happened in 2004 (gas conflict), in 2010 (oil conflict), in 2012 (dairy conflict). The latest one, the energy conflict lasted from May 2016 to April 2017. Every time Lukashenka responded to pressure by pressing on Russia’s sore spots. Belarus impeded Russia’s communication with the Kaliningrad enclave, cutting off its supply with gas and electricity. It ceased cooperation in the air defence sphere. It raised the prices for the transit of the Russian oil. Lukashenka made statements that led to assume that Russia had to pay for participation in the CSTO, EurAsEc, and even for the Union State. In these time spans, Belarus intensified political contacts with the West, to demonstrate to Russia that it could get support there, in particular, in the form of the IMF loans. In August-September, the Kremlin believed again that they could force Lukashenka into making concessions in the matters of genuine integration. In August 2018, events unfolded according to the usual scenario. Russia cut off the supplies of tax-free oil. The Russian information propaganda machine activated its work against Lukashenka. The President of Belarus was very poorly received in Sochi on 22 August. However, after a shower of pressure on Lukashenka, Russia backed down again. In October, agreements were reached meaning even bigger oil donations to Belarus from Russia. Russia admitted Belarus’s right to receive income from oil refining larger than previously in case oil prices on the world market rise. According to the Russian energetics expert V. Tanurkov, within the agreement on supplies of Russian oil in the volume of 24m tons per year at price $75 per barrel, oil donation to Belarus comprises around $3.3bn per year. In fact, Russia could have cut oil and gas donations and talked to Lukashenka about the necessity of real integration (as it happened from May 2016 to April 2017). One could make a number of assumptions why Putin put it to a halt such talks already in October. First, the Kremlin probably admitted the likelihood that Belarus would follow the Ukrainian example, setting the process of creating an Autocephalous Orthodox Church, independent of the Moscow Patriarchate. The decision of the Constantinople Patriarchate has set up the ecclesiastical law basis for a Belarusian Autocephalous Church, too. Moreover, autocephaly will not be strongly opposed to with the Belarusian society. According to the opinion poll, held by tut.by portal in October 2018, only 20.12 % supported the Russian Orthodox Church, whereas 26.54 % supported the decision of Constantinople. An informational campaign at the governmental level would shift the ratio in favour of autocephaly supporters. Or negotiations on pipelines and military bases? Second, Belarus and Russia might be negotiating gas pipeline installation across Belarus territory. There is unofficial information that in the first half of 2018, Belarus and Russia started talks on increasing the export capacity of the gas transmission system of Belarus. Laying a new gas pipeline through Belarus territory, alongside with the construction of the pipeline Nord Stream-2, will allow Russia to refuse totally from the gas transit via the territory of Ukraine. One can assume that the Belarusian side will insist that the new gas pipeline should be a state property of the Republic of Belarus. Third, Belarus and Russia will negotiate prolongation of the lease term for the Russian military objects currently deployed in Belarus. 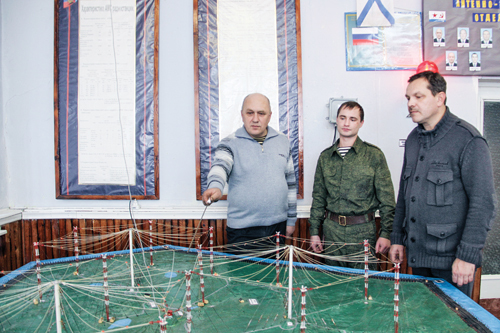 On June 7, 2021, the term of agreements expires concerning the deployment of the missile launch tracking station Volga and the communication centre for atomic submarines Antey. 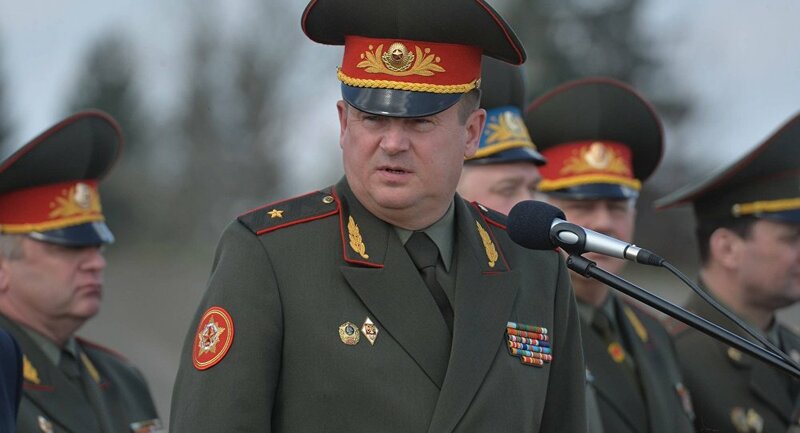 The Belarusian Minister of Defence Raukou said that before June 6, 2020, Belarus might report on its intention to refuse from the prolongation of these agreements. Andrei Liakhovich directs the Center of Political Education in Minsk.